Panama City Fla., police care for the youngsters who’s West Portsmouth parents officials say were passed out in an IHOP parking lot. According to a Facebook post of the City of Panama City Fla., law enforcement there arrested two West Portsmouth residents about 5:30 a.m., Friday after they allegedly found the couple passed out in their vehicle in the parking lot of an IHOP restaurant. Panama City police did not respond to phone call requests for comment. On the department’s Facebook page, the two adults were identified as Jordyn Freeman, 24, and Randy McMillin, 27, both of West Portsmouth. Officials claimed both were under the influence of drugs and further alleged officers could see drugs inside their van. The Department of Children and Families (DCF) local to Panama City responded and took custody of the children. Officers took Freeman, the biological mother of the children, and her fiancé McMillin, to the Bay County Jail. They are charged with child neglect, possession of methamphetamine and possession of drug paraphernalia. 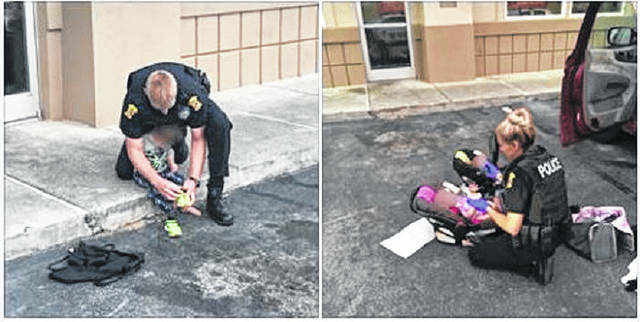 https://www.portsmouth-dailytimes.com/wp-content/uploads/sites/28/2019/04/web1_police-kids-jpeg.jpgPanama City Fla., police care for the youngsters who’s West Portsmouth parents officials say were passed out in an IHOP parking lot.